March 1, 2018: I have taken a bit of a rest from wirting these organs. However, I have stayed very much involed in the community. I have contributed to the development of the FCCLA and Wonder Morton organs, for example. 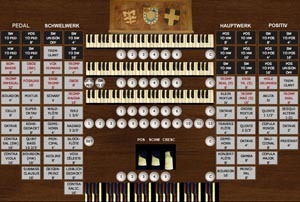 However, wtih the recent release of the Friesach "free" organ from Piotr Grabowski, I was once again inspired to create a version of my own. This is an excellent medium-sized neo-baroque instrument that, I thought, would make an even better, larger instrument. 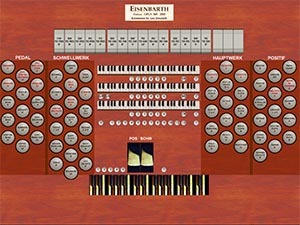 Hence my new "Freisach Extended Organ" is added below. March 9, 2014: Specially voiced versions of most of my organs are now available due to a collaboration with organist and professional voicer Mark Williams. Mark took five of these organs and carefully revoiced them using Hauptwerk's pipe-by-pipe adjustments. Unfortunately, these data are contained in Hauptwerk's "behind-the-scenes" organ configuration files. There is no easy way to share these files among users. Hence, for more than a year, only Mark and I had access to the new organs. I wrote some custom software that can take the information from these organ configuration files and create new organ definitions containing these data, making it possible to release these newly-revoiced organs to the community. You can read much more about the process (both the creative and technical portions) and download the new versions of the organs on the new "Voicings by Mark Williams" page. Of course, you still have to abide the individual licensing requirements of each organ as explained on their main pages below. I have taken the marvelous "essentially free" Pitea School of Music organ samples, created by Lars Palo and extended by Al Morse, and further extended it to create new larger organ I call simply "Les-Pitea." Al made his CODM file available for his extension and I used this as a starting point. I have enlarged this to have almost the same specification as my "Model 945" organ so I can use it as practice instrument in my home. Stan Harris, who has been using several of these organs, identified an error in some of the enclosure designs that caused ranks to sound brighter (though quieter) with the boxes closed. 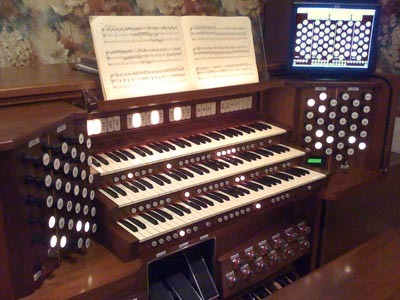 This affected the "Jeux d'Orgues", "Model 945", "Expanded Schantz", and "Litomysl" organs. I have repaired this and posted new versions on each of the appropriate pages below. If you are using an older version, I suggest you upgrade. I have updated all my Hauptwerk organs for Hauptwerk Version 4. For some, this means I can now include multiple release samples, since these are now handled by Hauptwerk's Custom Organ Design Module (CODM). I have now include crescendo pedals on all of my organs. I have also done some graphics redesign as needed. All Hauptwerk v3 organs are still available. To find them, please visit the appropriate new organ pages. There you will find links to the previous versions in case you still need them. Although these old versions will still work just fine, I do not plan any further updates of them. 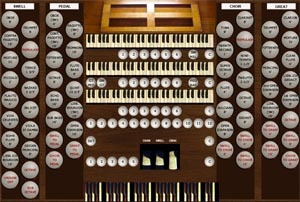 I have created a new organ, the "Model 945". It is my biggest Hauptwerk project to date and uses ranks from three different free Hauptwerk sets. 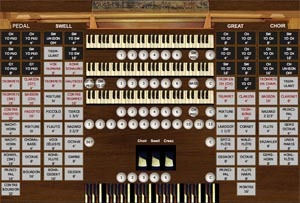 It duplicates the specification of my real Rodgers 945 organ shown below. This is a great-sounding and very full three-manual American Classic instrument that can be used for a wide range of organ literature. 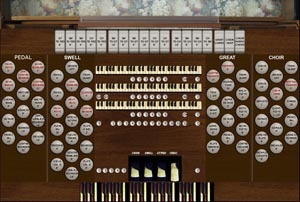 I have rewritten this part of my web space so that each organ project has its own web page. This main page links them together. I have updated my "Modified Litomysl Organ" for compatibility with Jiri Zurek's new 24-bit wet sample set. I have also added Al Morse's modification to my definti9ion that allows you to use the new multiple release samples for a much better sounding and more responsive instrument, assuming you have enough RAM. My old organ files will not work with the new samples so be sure to download my new version if you purchase Jiri's upgrade. I have just released v1.2 of "Jeux d'Orgues d'Trois Claviers". 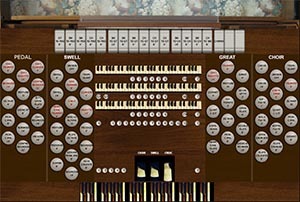 This is a three-manual version of the Jeux d'Orgues organ developed byJoseph Basquin and modified and expanded for Hauptwerk by Graham Goode. The update includes improved screen graphics (thank you Graham!) and a minor revoicing of the Swell division. I am converting a very large old electronic theater organ console as a controller for Hauptwerk. Please watch my progress here. Be sure to visit my a organ demonstration recordings page so you can hear music from these organs. Jump directly to the organs - download and have fun! I created this web page to have a place to post my software development work for various digital organ projects as a service to others who could benefit from this work. I do not have a commercial venture in this area. In the old days (more than 20 years ago now) I was very active in commercial development of digital organs and synthesizers but today I am content to do this to further my own personal enjoyment and performance possibilities. I use two software systems to create software-based organs for my own use. Hauptwerk is a very fine commercial product developed by Martin Dyde in the UK. It has the best audio rendering engine of any of the products I have tested. In addition, it has become a de-facto standard for people who sample real pipe organs either for commercial or preservation purposes. Hence there are many good sample sets available - though some are pricey. 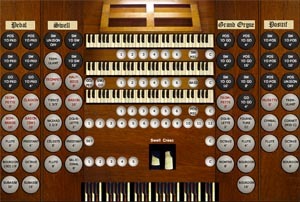 None of them comes close in cost to purchasing a physical digital organ. I use Hauptwerk for all my sample work today. Hauptwerk runs on Windows and OS-X. As a very heavy Mac user, I really appreciate this! jOrgan is an open source system developed by Sven Meier (and others) in Sweden. Being open source, it is totally free. It runs on Windows, OS-X, and Linux. jOrgan does not produce sounds. It is, however, a fantastic organ relay program with a great visual programming interface. It takes very little time to develop "consoles" and wire them to sound sources and keyboards. I use jOrgan as the front end to Hauptwerk. In this way, I combine the strengths of both programs to create a highly-optimized performance environment. By the way, I also play piano (and other things) in the Night Blooming Jazzmen. I maintain the web site for the band - hence it is a convenient place for me to post things like this. Take a look at the band pages too! Here is a photo of my "performance" setup at home. Im addition, I have a development system in my studio that looks nowhere near as pretty.